In case you haven't heard about them, let me tell you. HappyFresh is an app that allows you to order groceries from local supermarkets and specialty stores and have them delivered to your doorstep within one hour. Yes, you read that right. One hour. 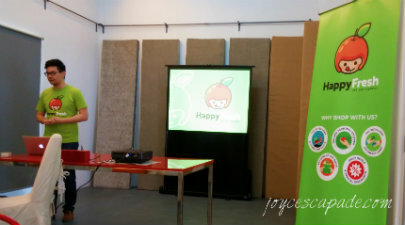 Opal Wu, Managing Director of HappyFresh in Malaysia presented about HappyFresh's concept and how to use the app. Here's to recap a few important messages that I would like to share with you all. 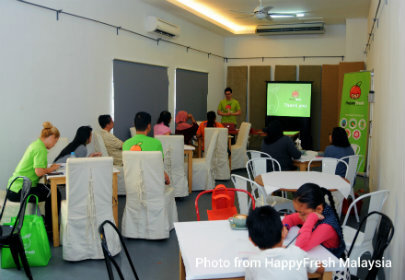 What does HappyFresh do? HappyFresh is committed to helping people eat healthier and enabling them to spend more time with their families, doing the things they love. 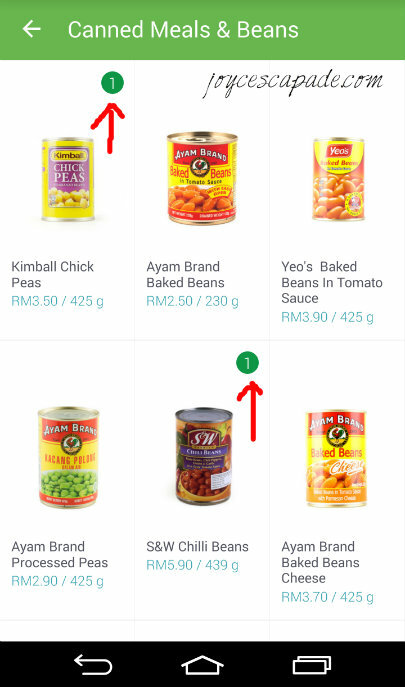 How is HappyFresh different from other online shopping services? No. 1, they are the only ones committed to offering their customers one-hour delivery; this is conducive for fresh produce as such fruits, vegetables, meat, and seafood. No. 2, they have a strong team of professional personal shoppers who shop on behalf of their customers and are trained to pick the best products for them. No. 3, they are a tech-first company that invests a lot of resources into making the user experience simple, enjoyable, and personalized. How reliable is the one-hour delivery promise? 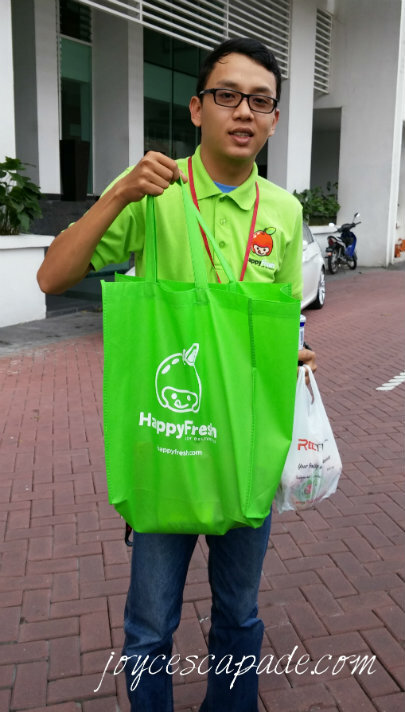 HappyFresh has personal shoppers and drives stationed at every partner store to guarantee the promise. The shoppers will pass the groceries to the drivers who will deliver them using thermally-insulated boxes mounted onto motorbikes to beat traffic jams. What if I'm not satisfied with an item I receive? If the item's quality doesn't meet your expectation, you can leave it with the delivery guy. You will only be charged for items that you accept. 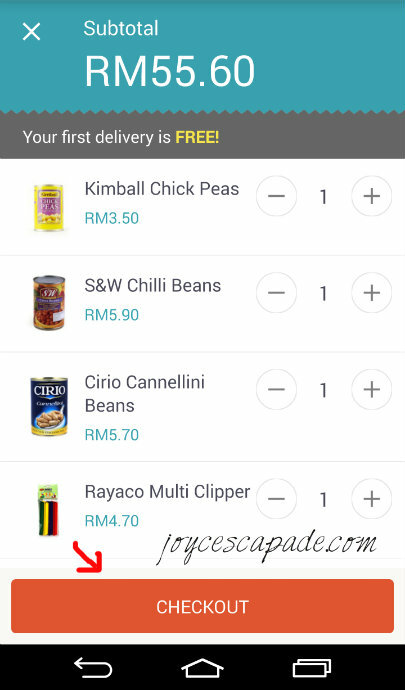 You can choose payment method: by credit card or cash on delivery on the app. How much does delivery cost? 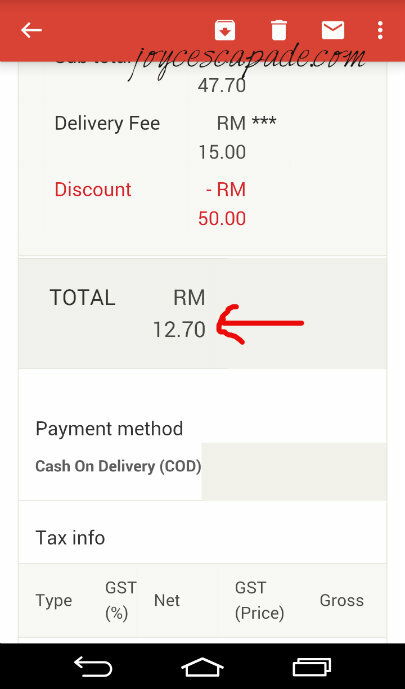 For next-hour delivery: RM20 for orders less than RM100 and RM15 for orders more than RM100. For all other delivery times: RM15 for orders less than RM100; RM10 for orders between RM100-RM300; and FREE for orders more than RM300. Delivery prices are shown clearly during checkout on the app. What if the item I want is "out of stock"? After checkout, you can choose specific replacements for any product, or without replacements. The personal shopper assigned to handle your groceries will give you a call about the replacement item. 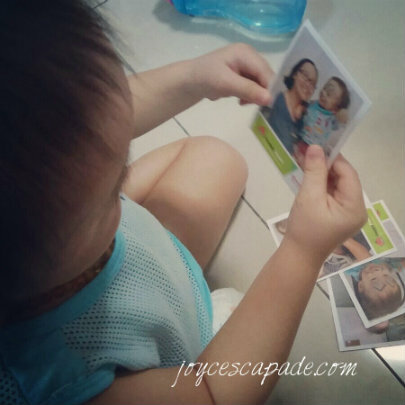 At home, he couldn't stop admiring the photos printed at a special photo booth ran by the face-painting team. Awww. 1. Download the HappyFresh App (Android or iOS) - I use their Android App. 2. 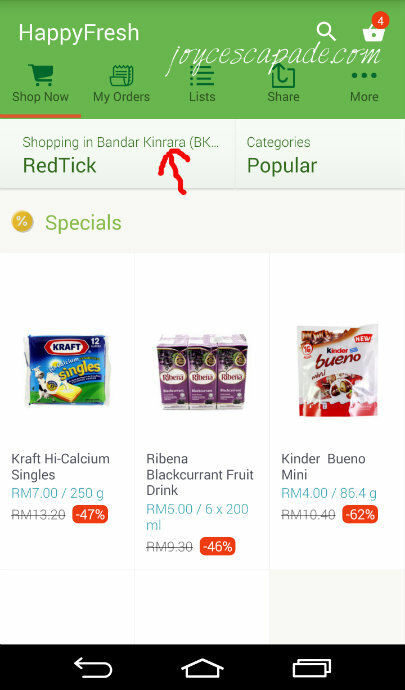 Select a store - For Puchong and Bandar Kinrara area, there's only one store to choose, i.e. RedTick. See arrow in screenshot below. 3a. 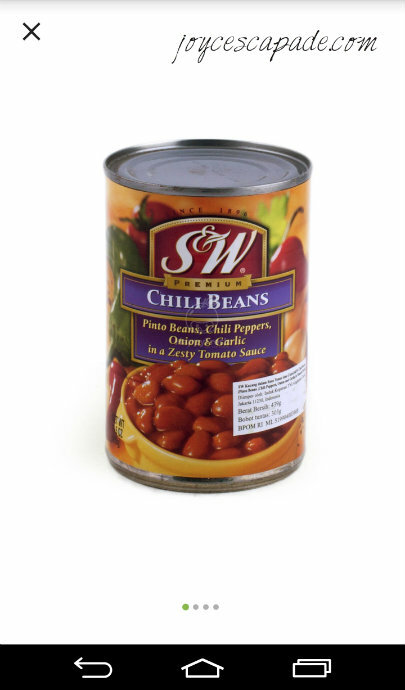 Start shopping - I want to get some canned beans, so I click on the arrow to expand the Dry & Canned Goods section. See screenshot below. 3b. 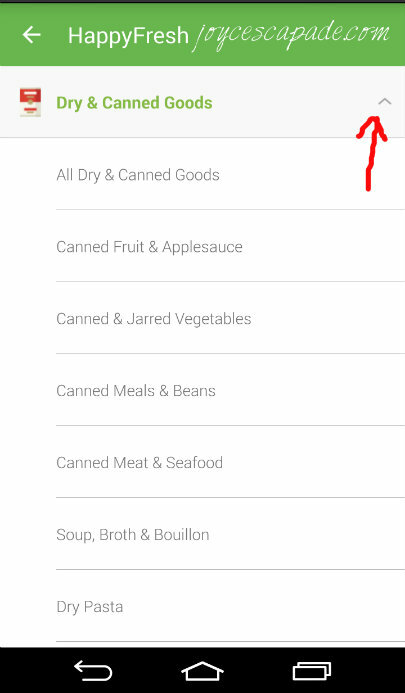 Continue shopping - For the items that I have clicked to add to my shopping cart, the total number of each item will be shown on the top right corner of each image. See arrows in screenshot below. 3c. Continue shopping - I can view details (brand, price, weight) on each image. I can tap to zoom in. I can also increase the number of items for this product by clicking the "+" sign at the bottom of the image. See arrows in screenshot below. 3d. Continue shopping - The zoomed in image. See screenshot below. 4a. 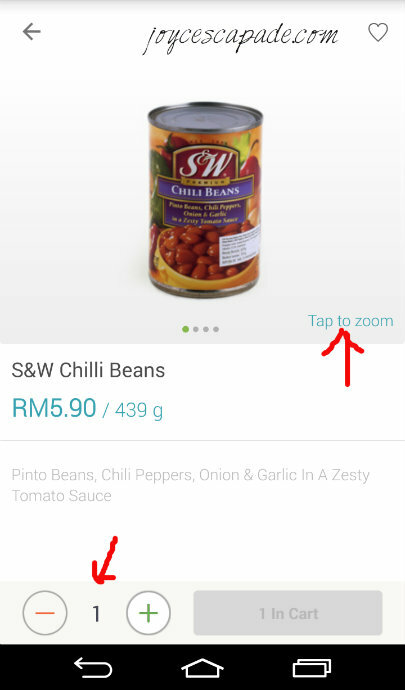 Checkout - Check through the shopping cart again, then press checkout at the bottom. See arrow in screenshot below. 4b. 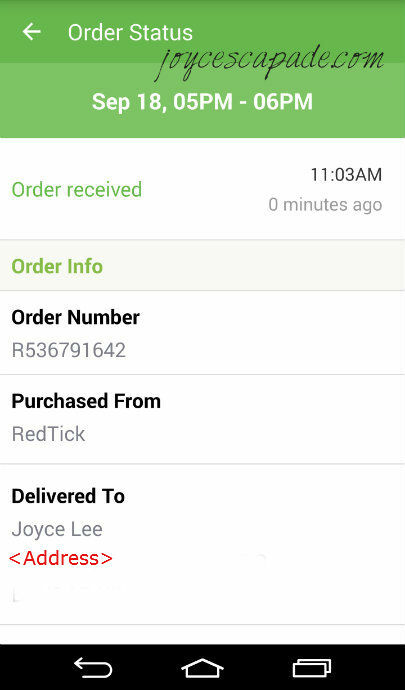 Checkout - I receive an order status summary complete with my specified delivery date & time range, order received time stamp, order number, store name, and my name & address. See screenshot below. 4c. Checkout - I also receive an email summary complete with my payment method, amount payable, and my specified delivery date & time range. See arrow in screenshot below. 5a. Delivery - When the scheduled delivery time is near, I receive another order status summary. I see that my personal shopper has started selecting my items at 4:05PM, then my order is packed and on the way at 4:40PM. That's so fast!!! See arrows in screenshot below. 5b. 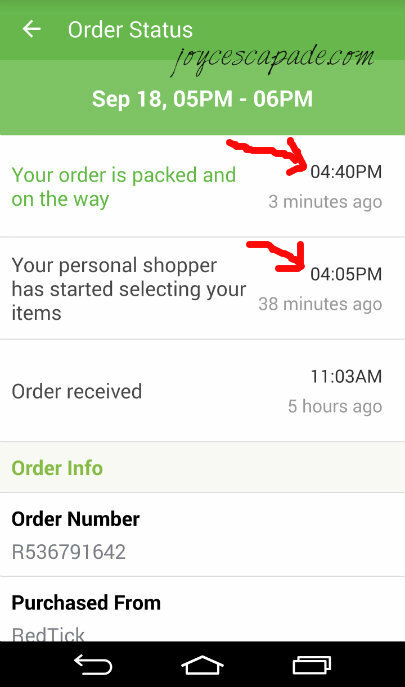 Delivery - And the delivery man arrives with my groceries at 4:50PM, that's 10 minutes before the scheduled time. When I choose 5-6PM, I'm under the impression that they will arrive near 6PM. Haha, I underestimate them! The dry items are in the green bag, whereas the wet item (fresh chicken) is packed in a separate plastic bag in order not to dampen the rest of the dry items. Very good service! Thank you! * I forgot to ask about his name, but he did a good job! 5c. Delivery - Finally, after paying and signing off, I receive an email summary. 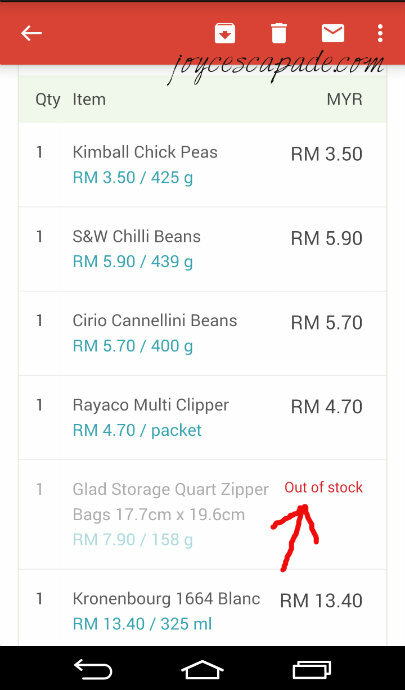 The 'out of stock' item is clearly listed, and I do receive a phone call from my personal shopper, informing me about this. See arrow in screenshot below. 5d. 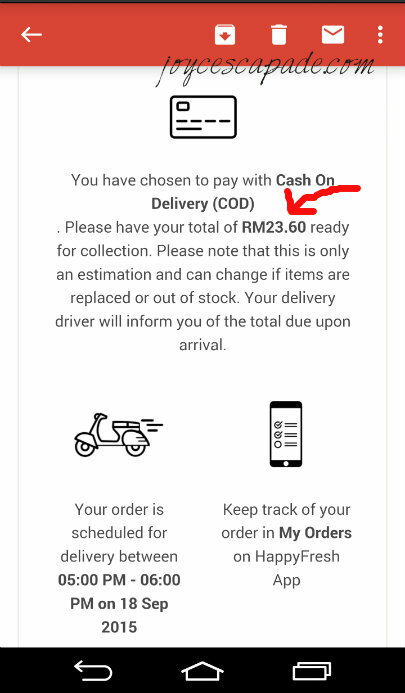 Delivery - Here's the final amount that I pay (I remember to enter a coupon code worth RM50 during checkout). See arrow in screenshot below. 6. 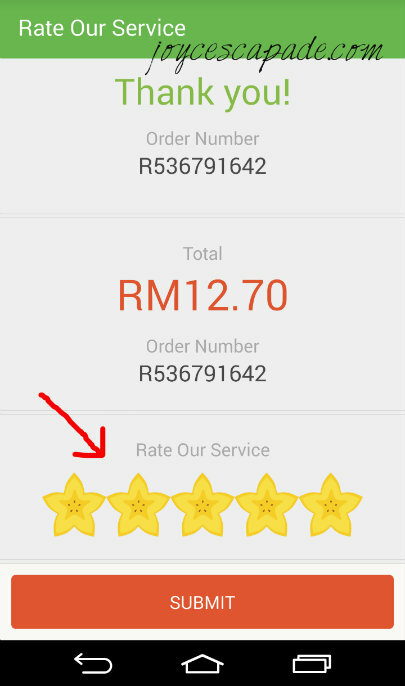 Rate Our Service - Needless to say, as a satisfied customer, I rate 5 out of 5 stars. See screenshot below. Will I use this service again? Download the HappyFresh app from Google Play Store or Apple App Store on your mobile device. Enter KLCCjoy during checkout on the app to enjoy FREE delivery and 50% off your first order*! *Discount valid for orders above RM100 and applies to the first RM100 only. I'm writing guest posts for HappyRecipe!